Does the boogeyman have boogers? Does Frankenstein Get Hungry? That is the question on the mind of a little sleepless girl. Well, one of many questions anyway. These questions make the “ghoulish seem foolish” and as she asks them, she is able to overcome her fears of the “things in the dark.” Monsters are no match for the imagination of this heroine! Of course, the adult will realize what is going on, especially on the last page as certain things come to light. The illustrations of debut author John Solimine compliment his rhyming text. 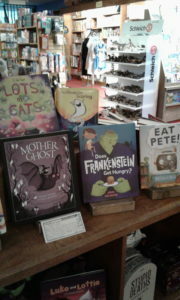 Both text and art work are whimsical and sweet, taking the spooky things we are thinking about and make them not so scary any more. Look at them for more story and a lot of hidden gems. And if you also wonder if the monster gets lonely under the bed you can ask your little one what might make it feel better (I personally think a teddy bear in stripped pajamas, but that is just me). And due to questions like, “Does Dracula floss his fangs?” you can ask other questions about what things your child and the monsters have in common. I think this book would work for the holiday, obviously, but also for anytime such as bed time (though for the child who might not have a huge issue with the “bumps in the night”) or for a regular story time during the day where the light is able to keep child and their mummy (and daddy) safe. And, by the way, does Frankenstein get hungry….? Share the post "Does the boogeyman have boogers?"